Sarah has been training people of all kinds, in both therapeutic and athletic capacities, for nearly 20 years. Her career has given her the opportunity to train with a variety of different modalities. 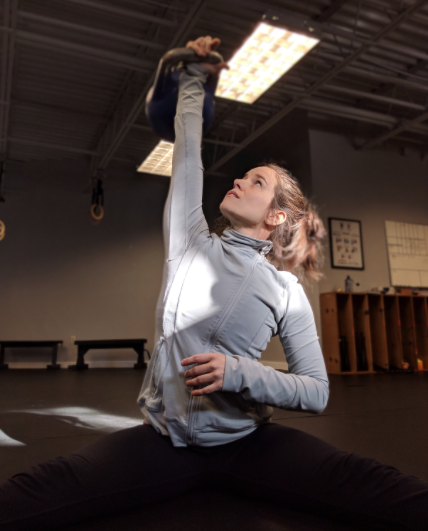 With a start in Physical Therapy (incorporating pediatrics, neuro rehab, and outpatient orthopedic PT), she learned to blend traditional rehab principles with the flexibility and fluidity needed for recovery and performance, eventually utilizing barbells, kettlebells, yoga, circus, CrossFit, maces/clubs, calisthenics/bodyweight, and more. Sarah is a powerhouse of movement tricks and information. “I do not subscribe to any single fitness dogma. I believe in curiosity, exploration, experimentation. I do not think there is only one way to become healthy and fit. It’s about finding what works for you. My goal is self-betterment, and I will use the tools and ideas that most efficiently (and safely!) move towards that goal, whatever they may be. I believe the best way to train involves being open minded, trying new things, sincerely addressing weaknesses and compensations, and learning to PLAY.